House Democrats passed a bill Tuesday night that would end a 26-year ban on drilling for oil in federal waters 50 miles or more from the Atlantic and Pacific coasts  in a belated attempt to find political shelter from Republican election attacks over gas prices. But even as House Speaker Nancy Pelosi steered the bill through procedural hurdles to passage during the day, Senator John McCain demonstrated the continued power of the issue on the campaign trail. At a rally in Tampa, Fla., McCain segued from prepared remarks on the uncomfortable matter of the Wall Street collapse (which he sometimes admits is the result of years of lax Republican oversight in Washington) and added comments on a much more rewarding topic: oil exploration. As he started on the subject, someone in the audience yelled, "Drill, baby, drill." To which McCain responded, "Right. Drill, baby, drill." To which the crowd responded, chanting, "DRILL, BABY, DRILL!" McCain admits, in less exuberant settings, that drilling will not affect gas prices anytime soon, but that's not the point. The issue is an electoral winner for Republicans. Between March and June, around the time when gas settled above $4 per gallon, the American electorate shifted from its long-standing 50-50 split between those who want more energy conservation and those who want more petroleum extraction. A Gallup poll in May found the split at 57%-41% in favor of offshore and wilderness drilling. A mid-June Pew poll found a 12-point swing since February in favor of expanded exploration and extraction, and a 60%-34% gap in favor of prioritizing developing energy sources over protecting the environment. The GOP recognized the shift early and focused its energy on blocking Democratic attempts to placate gas-pump shock through legislation that did not include expanded drilling. The more the Democrats tried, the harder the Republicans hit back. The GOP liked the issue so much that Republicans even stayed on Capitol Hill for part of the August recess demanding a vote on drilling. By then, Pelosi realized she was on the wrong side. She had previously told one interviewer that she wouldn't budge on drilling because she was "trying to save the planet." But a senior aide says that when Barack Obama came out in favor of a pro-drilling compromise emerging in the Senate just before the August recess, "she realized she was going to have to support it." In political terms, Obama's response was late, and Pelosi's even later  drilling had already become a one-hit wonder for the GOP. 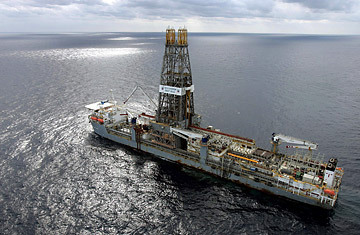 Although the Democrats succeeded in watering down the bill, limiting drilling to at least 50 miles offshore (the Republicans had sought a 3-mile limit), helping to pass any sort of drilling bill was not easy, after years of reliance on electoral support for conservation over extraction. "It's like a Republican waking up one morning and realizing that suddenly Americans don't want lower taxes; they want higher taxes," said a senior Republican aide on Capitol Hill. "It would take awhile to get your head around it." The issue has become, to some extent, the Republican answer to any and all questions that come up on the economy. McCain returns to it in nearly every speech on the subject, even though drilling has as much to do with the collapse of Wall Street financial firms or the falling job market as abortion does. The drilling issue may even help explain his choice of running mate  Sarah Palin's one area of true expertise can be said to be the politics of energy extraction. The Democratic attempt to get onboard the drilling bandwagon may not, in the end, make a lot of political difference. For starters, the Senate compromise bill will face several hurdles when it comes to the floor next week (some Democrats worry that it may be scuttled by a group of Senators headed by McCain's friend Lindsey Graham of South Carolina). And even if the Senate bill does pass, Democratic aides admit that at this late date, it may have as little impact on voters as drilling itself will have on gas prices by Election Day.